Part of a seismograph station which was assembled by the Lamont-Doherty Geological Observatory of Columbia University in 1972 for use in the Geology Department of The University of Queensland. 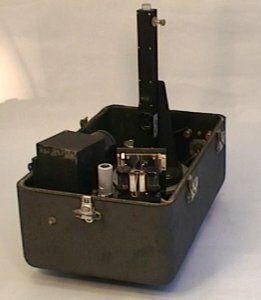 The phototube amplifier consists of a Kinemetrics Model LG-1 galvanometer, beam splitter, light source and phototube deck, in a sealed case, 30 x 51 x 48 cm, and weighs about 25 kg. The phototube amplifier is a galvanometer phototube amplifier designed to amplify very low-level voltages or currents in the long period region of the seismic spectrum. Light from the light source is reflected from the galvanometer mirror and focussed on the beam splitter-lens assembly. A phototube is located at the focal point of each half of the beam splitter lens. These phototubes are connected in series across a regulated voltage. The galvanometer is electromechanically adjusted so that when no current passes through the galvanometer, the light is evenly divided between both sides of the beam splitter, and then the voltage at the junction between the two phototubes is exactly half the applied voltage. When the galvanometer rotates, unequal intensities of light fall on each half of the beam splitter and the phototubes register unequal quantities of light, and the voltage at the junction between the phototubes varies accordingly. This voltage is filtered and passed to the output. A gain of 500 000 at .03 Hz is specified.